At that time, the objects were modelled and visualized on the computer screen using “simple” lineal structures formed by a single colour. Scientific disciplines like biology appealed to computing representation methods in order to solve calculations related to the continuous mutation of the graphic compositions characteristic of their analysis models. Ivan Sutherland (Lincoln Laboratory, MIT) developed the precursory system of the current procedures CAD, the Sketchpad in 1963. GUI, a graphic user interfaz, is able to accurately express the morphology of the represented object and its different parts; arising thus what today we know as “Object-Oriented Programming”. G/mol Space is a non profit-making investigation project. With it, its author, Manuel Viñas Limonchi, opens an experimental space within graphic computing and Virtual Reality… a place where researchers and professionals can expose their opinions and knowledge on the analyzed matter. 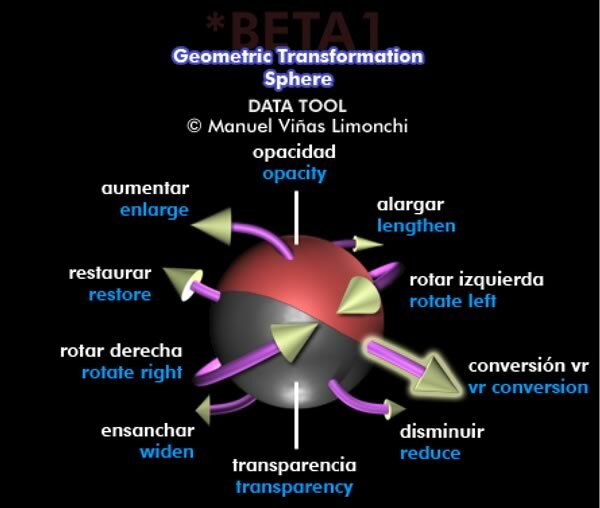 Although the digital application inserted here (the graphic interface located at the top) is an small initial beta, some of the essential concepts of certain 3D type interventions appear in this application. Thus, the space, the user-machine interaction and the stereoscopic visualization related to the three-dimensional model become G/mol Space’s main objective. Afterwards, in order to make spacial changes, you will be able (2) to move the selected molecule by pressing and dragging it with the mouse inside the “molecular interaction area”, situated on the left-hand screen. (4) Once the desired modifications have been applied, it is possible to transform the molecule’s visual appearance into a stereoscopical image by pressing “vr conversion”. I am currently working on showing a correct VR image by changing its stereoscopic, parallel and chromatic characteristics. (5) To return to the main index, press “restore”.